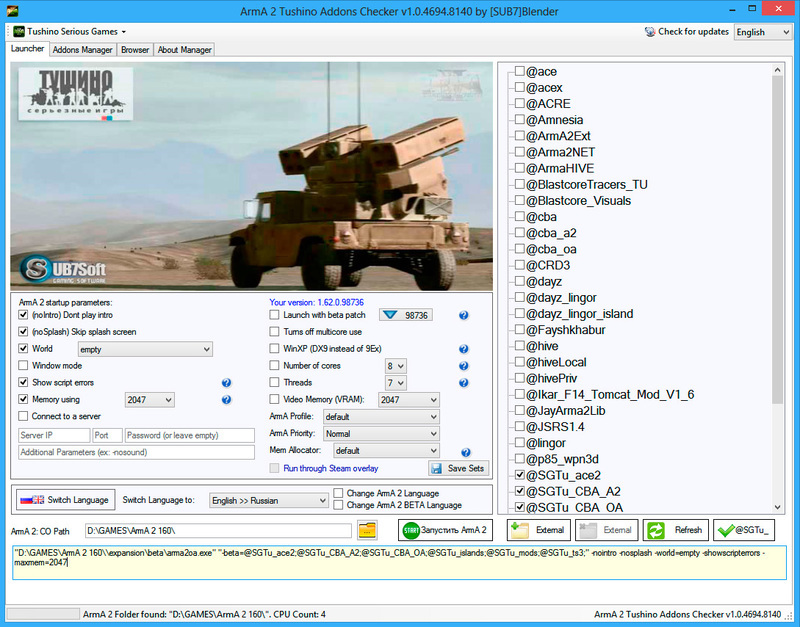 About half a year ago I started to create an application to simplify addons update procedure for one ACE PvP ArmA 2 server. Before we used Yoma AddonSync so its compatible with Yoma repository servers. So today I've decided to create a tread on BI Forums and share this app with everyone. I still use old Yoma's AddonSync... so I'm gonna give this a try... spasiba!!!! How about you stick to English on these forums like everyone else! I downloaded and tried this tool. It is good to see a new tool which is compatible with the Yoma-tool and adds features to it. Thank you for sharing it. - Ticking addons creates a "-beta=@addon-name" in the path. Should'nt it be "-mods=@addon-name"? - I like the "Tushino Ready" button. Can something like this be created by the user for a number of his favourite servers? - The "external" search for addons is a very good idea. Now we can keep the addons separate from the game. - Can you explain how to use the updater? When I tried to download the addons for Tushino, the updater was finished in second but didn't do anything. - How can we change the website shown in the browser? - I think it would be nice to offer a summary of the most important changes in English in the "About manager" tab. -beta instead of -mods is necesarry for Steam users with arma 2 and arma 2 oa in a separated folders. In further updates I'll add option to edit some buttons like "Tushino Ready", browser URL and add manager profiles but for now as I wrote in first post it has been made for Tushino. About updates - there are some speed limit restrictions (or even shutdown on traffic overload) on Tushino FTP between 20:00-00:00 GMT +4 in case of 100-200 players playing on Tushino servers (especially on weekends), also check app's file write permissions (run as administrator). Thanks for your explanations BlenderRus. I'm looking forward to your updates. Thank you very much for such a nice launcher! Will there be any update to include other servers than yours in the future? The description says this is compatible with RFT (Reinforcements), but the launcher only looks for the OA executable. i am looking for a "how to" for Yoma repo for Admins. I want to know how i can make a Yoma Addon Server. I have Game-Server and want that the Members can just Yoma to sync there addons to the Game-Server. So, does someone have a link to some usefull things for me ?